Your feedback from my previous article, Why the Public Should Care About the Institutionalised Abuse of Their Ambulance Workers, has been overwhelming and emotive. It is patently clear from the comments left anonymously by many practicing frontline ambulance personnel that the UK ambulance workforce is beleaguered, demoralised and pushed to breaking point. It is quite clear that feelings range from impotent rage to embittered resignation. For me, the responses to this one article opened a Pandora’s Box and I quickly came to realise that something more needed to be done. The comments were right, there was little point in writing about a worsening problem if those who have the power to address it were oblivious. I resolved to find out for myself and convey our concerns to the ambulance powerbrokers. 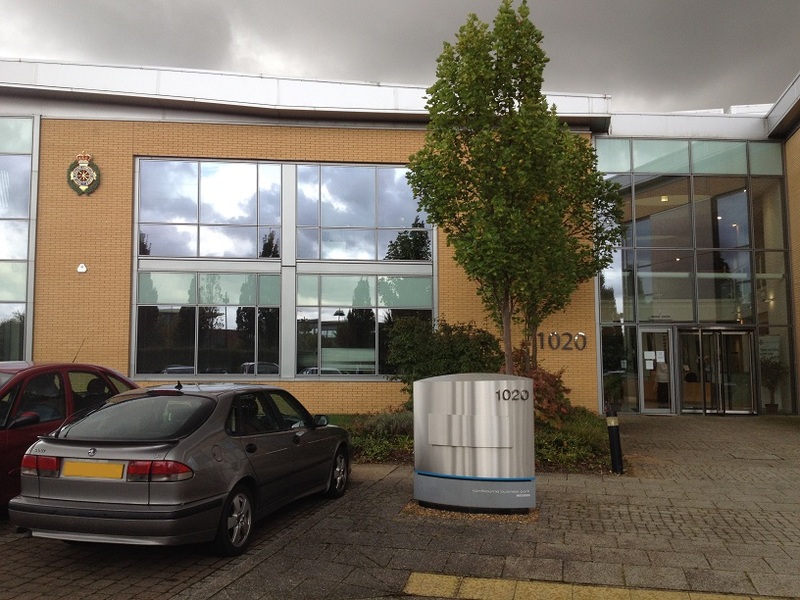 So earlier today I attended the East of England Ambulance Service board meeting, held in public at their Cambourne Headquarters in Cambridgeshire. 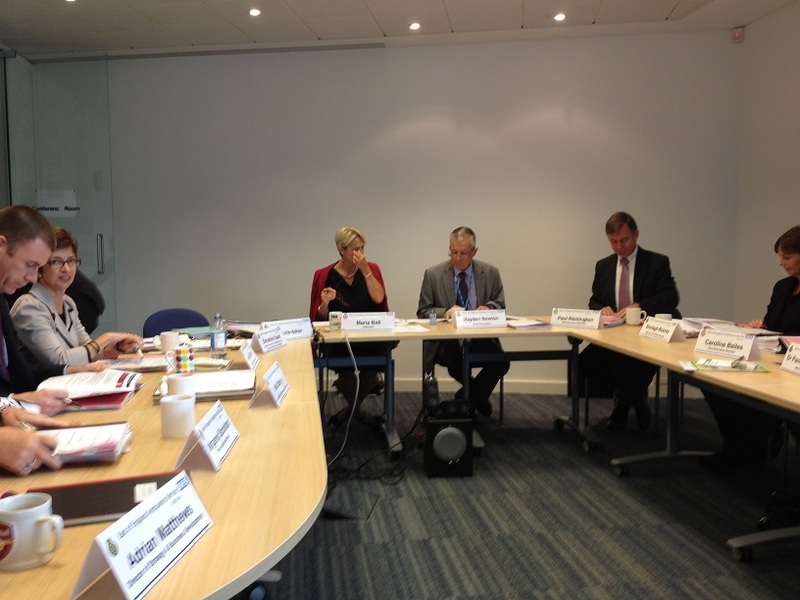 The Board of Directors was in attendance, including chief executive Hayden Newton. My purpose was manifold; to gain a better understanding of those who make the decisions that led to the systematic abuse of their workforce, to see if they were aware of the ramifications of their decisions and to challenge them to take better care of their road crews. These seemed like simple, righteous objectives, but as I drove up the A10 it started to feel like I was walking into Mordor. Fortunately, I was aware that I was not the only public party attending the meeting. Denise Burke, North Norfolk Labour Party Chair, was also inbound to present the 6,503 signature Act On Ambulances petition protesting against the proposed cuts. When I arrived, I was relieved to see a gathering of ten or so individuals, including the Act On Ambulances entourage. 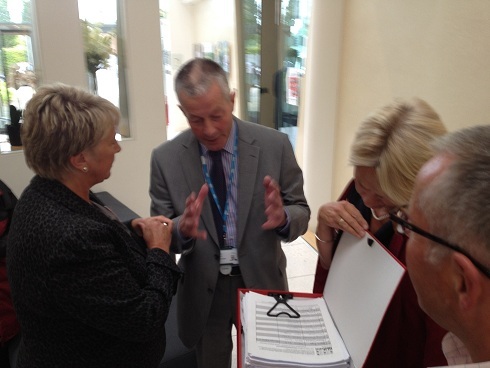 Denise Burke (Lab) presented the 6,503 signature Act On Ambulances petition to the EEAST Chief Exec. From the perspective of a formerly active paramedic of 12 years experience in their organisation, I recognised some names, but few faces. Sitting in a plush glass-walled office environment faced with a phalanx of besuited strangers, I was worlds away from the familiarity of the crew room or even the run-down training school classrooms I recall being shoehorned into for clinical lectures. I think it is fair to say that proceedings were dry and fairly impenetrable. I was aware that The Board met in private both before and after the public session, so much of what we were witness to was for show. But there was little attempt to explain the boardroom jargon and references to obscure reviews and documents. The onus was on the observing public to have read through all relevant literature beforehand. I managed to follow much of it, but I felt for the many keen laymen who were also in attendance – I imagine they would have been baffled. Little wonder that by the end of the first hour, a number had already left. There were many points raised and issues discussed that I will not go into here – I need to research further to fully understand the context of my notes and I plan to cover those topics in separate blogposts. For now, I’ll stick to the impression I gained of this group of individuals who are leading East of England Ambulance Service into whatever future awaits. Primarily, it is this: They exist in a world where they couldn’t possibly grasp the relentless reality that faces road staff today. Now. All relevant information is sanitised and boiled down into reports and statistics so they can make broad decisions affecting abstract concepts like demographics, tiers and targets. If the video we watched regarding patient feedback is anything to go by, the material is carefully selected and vetted for positivity. We were shown an interviewed account of a patient’s relative, seated presumably in her home, detailing her concerns over the lack of clinical knowledge of a Hickman line by the initial call-handler. She explained that, after her initial concerns had been allayed by being passed onto a clinician, everything went very smoothly. Her remaining dialogue was a glowing review of her other ambulance experiences. It was noted by Sheilagh Reavey that additional training is in place to address concerns about call-handlers and the board allowed themselves a moment to feel very satisfied with the results of their good work. I sat through two hours of laboured and staged discussion, but there were parts that were relevant to my purpose. Specifically, in a discussion about ambulance delays at hospital, Hayden Newton identified that crews being stuck at A&E waiting to offload a patient at the end of a busy shift made staff “really cheesed off” and persistent late finishes were a real “morale buster”. Suddenly, there was hope. Some staff concerns at least had found their way to the top. After identifying that hospital delays cost the Trust £2.7m in lost time, they described delays of over one hour as a “never event” (ie. it should never happen). However, they continue to occur and the problem lies with A&E departments. With that, they moved on. Later, Christina Yuell briefly mentioned issues with staff sickness and the challenges presented by “increased activity”. She said approximately two sentences. As far as I could tell, those few moments were the only times anything linked to crew welfare was discussed. The remainder of the meeting was focused on other concerns I’ll chew over at another time. The two hour session was over; I was grateful to be able to stand – my lower back does not do sustained sitting any more. On reflection, I can understand the necessity of the target-led, figure-heavy approach to managing a large organisation. At this level, that is their job – to make broad decisions on policy and set up the means for subordinates to implement changes. It is a shame that these individuals are almost entirely divorced from the realities on the ground. Presumably they, like the road staff, are trying to do their jobs effectively and they can certainly riff about datasets and “deep dive” analyses like professionals. No one sets out to achieve incompetence and I saw no reason to believe that this board doesn’t know their onions. Some individuals stood out more than others, but without researching them more it would be unkind to single anyone out. These are people who are easy to facelessly demonise when standing in the pouring rain at your eighth consecutive emergency call, but face-to-face, I couldn’t help feeling they were at least trying to do some good, even if crews and patients are just numbers in a table to them. Besides, the whole thing was a pantomime for the benefit of the watching public and I’m pretty sure it was carefully engineered for exactly that purpose. The real decisions happen elsewhere. As I stood in the corridor discreetly attempting to unfurl my misbehaving vertebrae, people started to file out of the conference room. Then I saw Hayden Newton, so I took my chance and approached him. He seemed quite affable and open to a conversation, so I asked what measures were being taken to ensure crew welfare. His response was a little disappointing – he started reeling off services such as physiotherapy, chiropractic treatment and a host of other treatment-based services. Nothing of a preventative nature – only attempts to fix staff after they’d already been driven into the ground. I felt he missed my point, so I rephrased the question and asked about the sheer volume of work being foisted upon the crews. He held up the incoming rota changes as a positive force to more accurately apportion work to the right resources. I was not convinced that he was understanding the gravity of the situation facing road crews when he started to talk about his operational days in Peterborough which, with all respect to him, would have been the Nine Circles of Hell away from today’s frontline experience. One thing he said did make sense to me. Whilst discussing the financial state of EEAST, he accepted that he could not rule out that the reduction in funding could lead to a downturn in performance. But presently, there is no way to prove to the Government purse-holders that current funding is inadequate. The existing rota and the current distribution of resources is based on old data which is unsuitable for current demand trends. In order to make a case that more money is needed – and it is a case he says he would be happy to make if required – The Board needs to be able to show that they have used existing funds as effectively as possible. I cannot argue with his logic here, presumably at that level it is the way the game is played. Few road staff would argue that the present system is sub-par; it misuses resources, it brutalises crews and it fails to deliver an effective level of patient care on a consistent basis. Whether the new system will be any different remains to be seen, but as one anonymous commenter on the previous post said, “What we can’t do, is nothing.” There needs to be a concerted effort to send the message of crew plight up the chain of command, as it seems they are impervious to disquieting anecdotes in corridors. So in short, unless the new system far exceeds crew expectations, things are very likely to get worse for road staff before the Board of Directors can even “make a case” for something better. Change is coming, we can only wait with bated breath to see if it succeeds or fails. I think we all know what will happen. And it won't be them who suffer. It will be the already defeated workforce. So what do the management actually need to change ? Where is the waste ? mat i applaud you for your efforts in bringing the plight of the ambulance service to the public eye, i was shocked to see you had left and was no aware why. i wish you all the best mate.